As promised, today we are sharing our first recipe in partnership with Phoenix Public Market, Contadino’s Pie! Each month we will share a recipe that utilizes ingredients primarily found at the farmer’s market. Recipes may also use ingredients commonly found at home (ie: milk, salt, flour, etc.). We have found that having a recipe in hand helps when shopping helps immensely (for more tips, take a peek at our Farmer’s Market Survival Guide). For this recipe, we wanted to feature The Proper Beast‘s Sweet Italian Sausage. We really love their products and thought they would be perfect. With fall coming, we also wanted to make a recipe that was a bit heartier and great for cooler weather. With the lovely potatoes we found and all of the other veggies available, we decided to do an Italian style Shepherd’s Pie. The name Contadino’s Pie comes into play because a contadino is an Italian farmer. 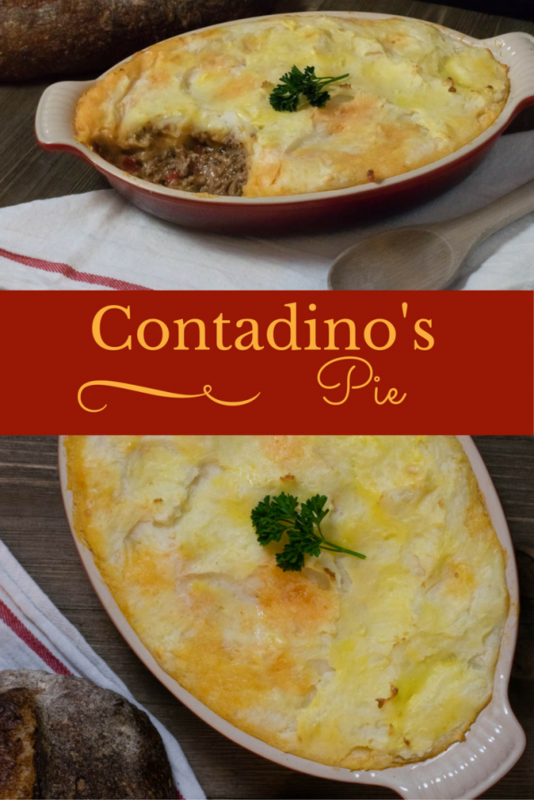 We hope you enjoyed our first recipe, Contadino’s Pie! We can’t wait to create more recipes for the Phoenix Public Market. Here is where you come in though. We need to know what ingredients you want to see! Do you want more side dishes, main dishes, or something entirely different? We want to help you and this is how you can make that happen! Let us know in the comments below or using the hash tag #GeekEats! Cut potatoes into 1/2-inch pieces. Place in a medium saucepan and cover with cold water. Place on high heat and bring to a boil. Once boiling, bring heat to a simmer. Add milk, butter, salt, and pepper. Mash. Using a cheese grater, grate tomatoes into a bowl. This will create about a cup a pulpy liquid. Set aside. Place the olive oil into a large saute pan and set over medium high heat. Once the oil is heated, add the onion and red peppers and saute just until they begin to take on color. Add the Italian sausage, salt and pepper and cook until browned and cooked through. Add the tomato puree, basil, and parsley; stirring to combine. Bring to a boil, reduce the heat to low, cover and simmer slowly until the sauce is thickened slightly. Spread meat mixture evenly into an 11 by 7-inch baking dish. Top with the mashed potatoes, starting around the edges to create a seal to prevent the mixture from bubbling up. 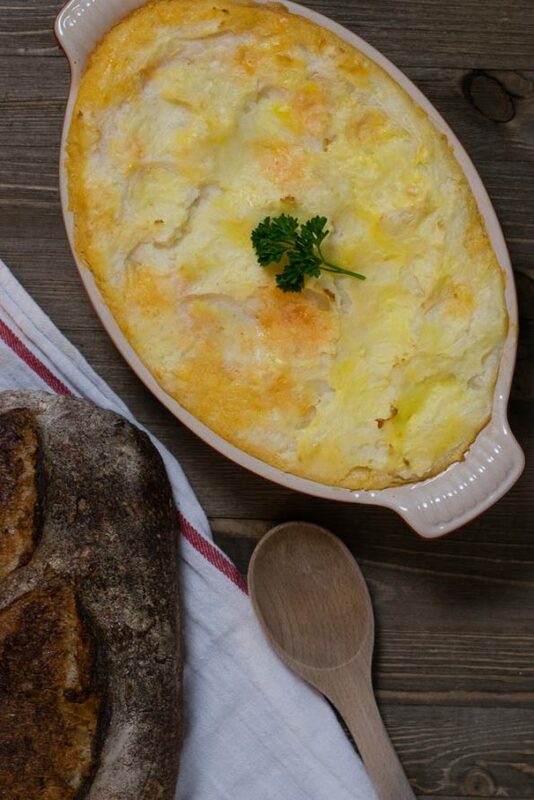 Using a pastry brush, beaten egg yolk lightly across the top of the mashed potatoes. Place baking dish on a parchment lined baking sheet on the middle rack of the oven and bake for 25 minutes or just until the potatoes begin to brown.